Circa 1820. 3-bay mausoleum with crowstepped gables and crypt to rear in fall of ground. Principal elevation to North with 2-leaf timber panelled door in pointed-arch architrave and 2-light cusped window above. Substantial buttresses with triangular-capped shoulders at angles and dividing bays. Blind pointed-arch windows to side elevations with uncarved shields below. Small bipartite window to S gable and timber-boarded doors to crypt. 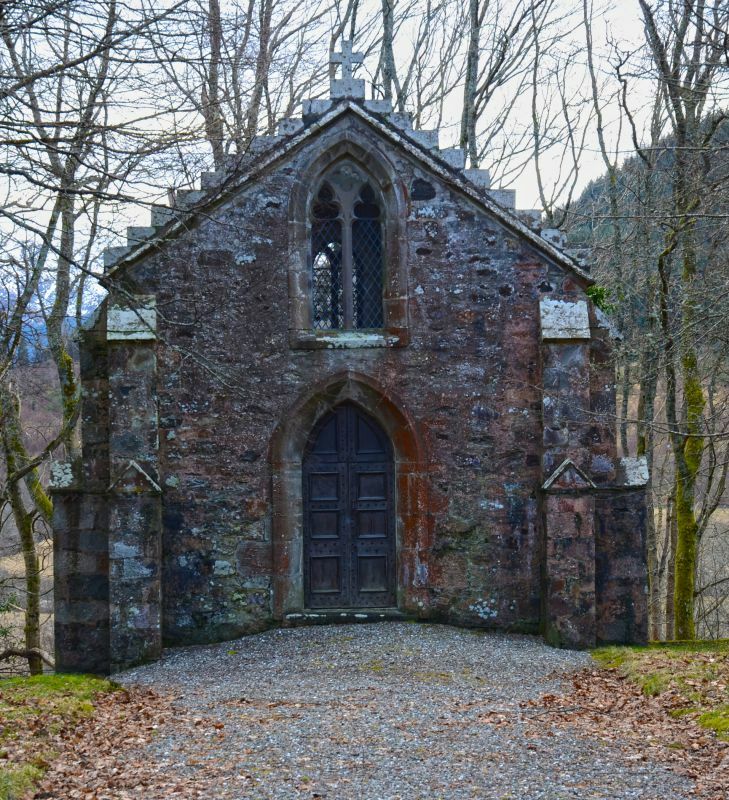 A good, and very well preserved example of an early 19th century mausoleum, occupying a relatively prominent position in the centre of Auchtubh. Interior: arched stone recesses in tiers of 3: 3 bays along side walls and 1 bay at end wall. Some recesses plastered over and marked with memorial stones. The earliest memorial is dated 1822 and is decorated with cherub heads. Materials: random rubble with polished ashlar dressings. Stone-slabbed roof. Boundary Wall, Gates and Gatepiers: curved random rubble boundary wall with central entrance to N: square ashlar gatepiers with domed rubble caps; 2-leaf, spear-headed, cast-iron gates. Built for the MacGregor Murray family, who held extensive lands in the Parish, and who built Edinchip House at about the same date (see separate list description). The date of the mausoleum is given in its previous list description and in 'Buildings of Scotland' as 1830. It is unclear where this information came from. A mausoleum is mentioned in the funeral directions for Sir John Murray (July 1822), and it seems that this mausoleum was the one that was being referred to. The earliest memorial stone in the Mausoleum is dated 1822. The mausoleum had evidently been built for some time, as the author of the funeral directions was not sure who had key to it.